Today got off to an early start. I was awake by 6 after a restless night of little sleep. This was more about not being in my own bed more than it was anxiety about the walk I was going to do. 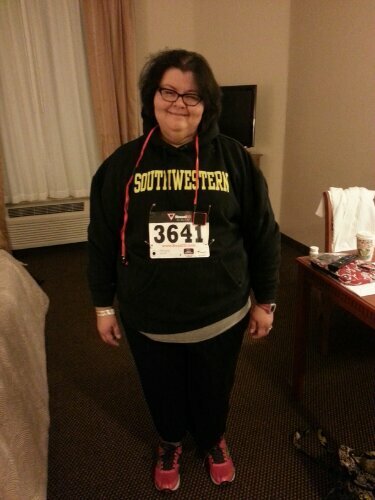 But I got up, took a quick shower to try and wake up a little more, and got dressed for the walk. I put on layers because I knew it would be cool outside. 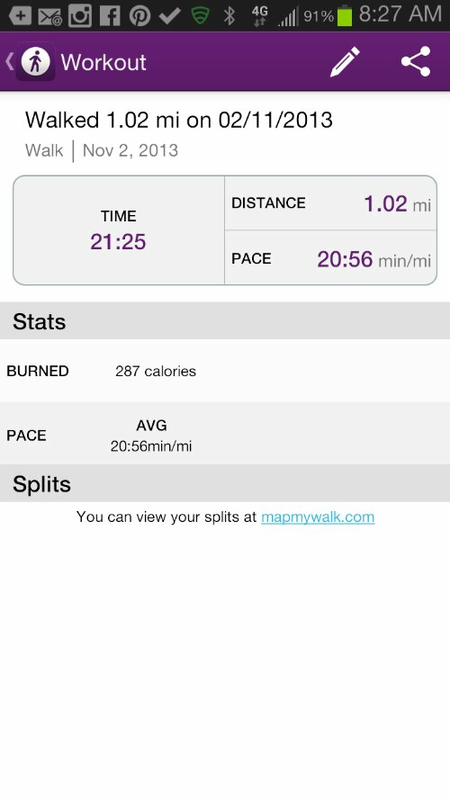 I had my heart rate monitor strapped on, my iPod clipped on, and MapMyWalk ready to go. We got to the university around 7:30 and the walk began at 8. Today was a gorgeous day for a race. The weather could not have been better–clear skies, cool breezes, and no rain in sight. All the racers started at the same spot but there were two different courses marked: one for the 5K, and one for the 1-miler. Once we all lined up, and the national anthem played, we were off. I began walking briskly, and runners of all ages and abilities began passing me immediately. 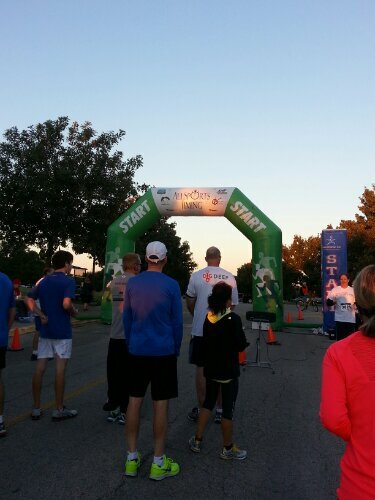 I tried to focus on my own goal of finishing in 25 minutes or less and pushed on. I had my iPod on, listening to the playlist I’d created for the occasion and followed the signs marking the path for the 1-mile walk. 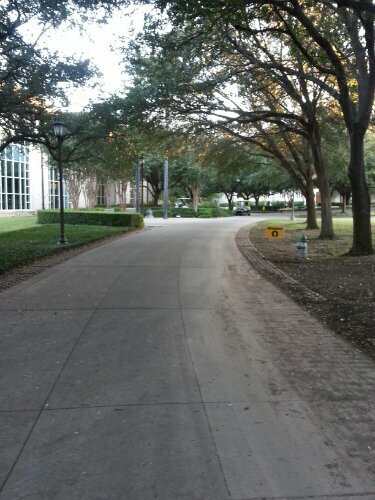 My path took me through campus, and I won’t lie, I am pretty sure I went to one of the most beautiful college campuses ever. Along my way, I alternated fast walking with short bursts of jogging just to see if I could do it. I surprised myself when I discovered that I could actually run for short distances. This is something that I never thought I’d ever be able to do again. But now…I am starting to see the possibilities and it’s exciting and freeing all at the same time. I exceeded my own expectations and surprised myself. I was nearly 5 minutes under the goal I’d set for myself. At that moment it didn’t bother me that several folks had finished the 5K well before I’d finished the 1-miler. I finished in less time than I aimed for. I was pretty pleased with myself and proud of what I’d done. I hadn’t moved that fast on purpose in over 20 years. I had not run anywhere in that long either. I started thinking about when the next time I would do this again would be. I think I will start the Couch to 5K program earlier than planned. There is another 1-miler in January, but my issue is the temps in winter–I get hives when I am exposed to the cold for any length of time, no matter how many layers I have on. And now that my natural insulation is melting away, I have a tougher time staying warm. After the walk, we stood around and waited for about an hour while door prizes were given away (I won one) and I downed two bottles of water. I’d eaten the leftover mahi from last night’s dinner as a pre-walk snack but had no carbs, and my blood sugar levels were tanking fast. We went to breakfast, and I was nauseous. Thankfully we didn’t wait long, and I was able to get something with some carbs in it in my system. Once I nibbled on the hashbrowns that came with my scrambled egg plate, I felt better and my queasiness subsided. The rest of the day was spent watching my university’s Homecoming football game (we lost) and spending time visiting with good friends. Today was a success all the way around, in more ways than one. I wish I could have more days like this. Today’s eating was pretty okay, even though I was a bit over my usual calorie goal of 900 calories. According to my Fitbit, I burned over 600 calories today just walking around, so I’m not worried about the slight overage. I got in 106 grams of protein and 47 grams of fat. 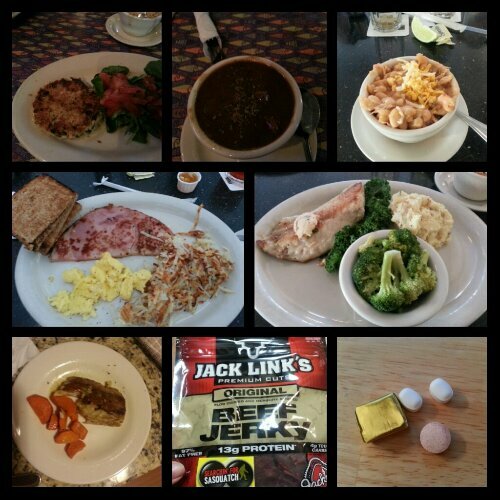 Today's food choices, from upper right: white bean chicken chili; grilled Gulf drum with steamed broccoli and mashed potatoes; multivitamin and calcium supplements x2, iron supplement; leftover blackened mahi (I didn't eat the carrots); Jack Links beef jerky; scrambled egg with ham and hash browns with whole wheat toast; chicken and andouille gumbo (no rice) and crab cake. This entry was posted in big things, challenges, daily bites, eating, exercise, goals, post-op, success, the sleeve, vsg, weight loss surgery and tagged aspiring runner, benefits of wls, daily bites, exercise, goals, Jameson 5K, NSVs, post-op eating, post-op life, sleeve gastrectomy, VSG, vsg realness, werk!, WLS, workin' on my fitness. Bookmark the permalink.